I recently took a trip to Vancouver. The weather was much nicer than in Toronto, about 10 degrees cooler. This was our fourth time going to Vancouver, so we knew where to stay (Davie Street, not because it's the gay district but because it's close to English Bay) and we knew where not to go (Hastings and Main). We took an "airporter" bus but this turned out to be an expensive, less-than-convenient alternative to a taxi. The kicker is that we had to switch buses a few blocks from our hotel, but the bus we switched to drove all around the city in a big circle until finally dropping us off an hour later. It would have been faster for us to walk from the transfer point, dragging our luggage on its pitiful wheels. But after this dismal start the rest of the vacation went really well. The first night there was the final night of the fireworks festival. We went to English Bay relatively early, around 7pm, when there were only about 200,000 people waiting for the show to start. I estimate that the crowd doubled in the three hours we waited, until there were so many people that we were standing on a bench because there wasn't room for us to sit (people crowded too close to the bench) and some people were actually climbing on the bench to try to get by. But the fireworks were good, and I wish I'd had a tripod there to photograph them. After that we spent the rest of the time wandering around Vancouver and relaxing at English Bay. We also went on a walking tour of Gastown, where I learned that the fire department used to (in the old days) sell its horses to the police, milk-men, whoever, once the horses were too old to pull fire-wagons. But the horses had been so well-trained that whenever a fire alarm sounded, all the police and milk-men showed up at the fire along with the actual firemen. Overall the trip was relaxing and fun. The only real excitement was when two F117A Stealth Fighters flew overhead. I'd never personally seen this plane flying and was so surprised to see two of them that I just gaped like a drooling nitwit until I realized that I was holding my camera. I tried to snap a picture but unless you know ahead of time that it's a picture of two aircraft you'd be forgiven for missing those two stealthy specs. Our last night there was eventful as well due to a false fire-alarm which caused us to evacuate. Too bad the Vancouver FD doesn't use horses anymore. The Toronto Star has an article about cyberslacking. It basically says people spend all their time at work surfing the Internet instead of working. However it doesn't mention one of the worst offenders for cyberslacking: www.tetesaclaques.tv. This website, based in Montreal, is a collection of hilarious animated clips. The clips are in Quebecois French, which in this case is about as far from standard French as classic Newfoundland English is from the Queen's English. Speaking of English, half the words actually ARE English but some people do speak that way in Quebec. Anyway, it's great fun and if you can understand the dialogue you'll laugh your head off. I learned the other day that fetuses urinate in the womb. Apparently the amniotic fluid is primarily composed of fetal urine (after 11-12 weeks), which is swallowed and re-urinated by the fetus. Luckily for the mother (and the fetus, I guess) this urine is totally different from normal urine. Still, this makes me glad I'll never be pregnant. Sometimes, as a software developer, you have to debug very odd problems. One strange one that I worked on recently was that, after deploying a new version of a website, logins spiked to crazy volumes. It was as if every user was logging into the site again and again. Clearly they weren't doing that, but there didn't seem to be anything wrong with the site. We tracked down the issue by logging all URLs visited and found that, when Internet Explorer visited certain pages, a request for "/" was made. For you non-technical people, this is the home, or landing, page of the site, the page you get when you visit http://www.google.com/ as opposed to a specific page at Google, such as http://www.google.ca/intl/en/about.html. On the website in question, requesting the main landing page will log the user in if they selected "remember me" the first time they logged in. This tag, which on Firefox does nothing, causes IE to request / as the source of the image. Seems pretty odd since I've never come across a website that uses images as a landing page, but what can you do? We changed the page and removed this empty tag and the problem went away. I read a press release recently that discussed an issue I am familiar with: The EpiPen. The authors of the release, King Pharmaceuticals in collaboration with Anaphylaxis Canada, claim that only one in five allergic individuals carry an EpiPen and 40% of the population would be unable to administer an EpiPen dose if someone was having an allergic reaction. I'm surprised that that second figure isn't higher, but in the interest of my and every allergic individual's safety, I am going to go over the procedure for administering the EpiPen. Remove the EpiPen from its carrying tube. Take off the grey safety cap. Hold the EpiPen firmly in your fist, with the black tip near the patient's outer thigh. Jab the black tip of the EpiPen firmly into the patient's thigh at a 90 degree angle. Hold for 10 seconds. After 10 seconds (the EpiPen's window will show red) the injection is complete. Remove the EpiPen and massage the injection site. Put the used EpiPen into the storage tube. The exposed needle will be protected in the tube. Do not touch the needle. It's very straight-forward. But there are some people who've seen too much TV and think they need to jab it into the heart or some other nonsense. This is not Pulp Fiction. There is only one good injection site, which is the thigh. The reason is there can be reduced blood-flow at the injection site and if it's injected somewhere else (say, the hand) you can get necrosis. That's latin for death of the tissue. I know some of you out there are thinking of some funny wise-crack about this process but I urge you to stifle it and consider these instructions carefully. Knowing this could save someone's life. The EpiPen website has a PDF with more detail. There are many ways to die in this world. Some of those ways are violent or gory, like being eaten by a shark. Some of those ways are stupid, like the guy who cut of his own head with a chainsaw. And some of those ways are just plain embarrassing, like a woman who was smothered to death by a horny camel. A 60-year old Australian woman suffered this fate when her 10-month-old pet camel knocked her down and made his move. This just goes to show that you should always spay or neuter your pets. Ben Goldacre, a doctor, writer for The Guardian and blogger at badscience.net, writes about a study by some researches in the Messina University in Italy, that compares Down's Syndrome patients to Oriental people. In 1866 John Langdon Down wrote “Observations on the Ethnic Classification of Idiots”, which was the first paper to describe Down's Syndrome patients. In that paper Down compared various "idiots" and classified them according to which ethnic group he felt they belonged in, arguing that mental retardation was really a genetic throwback to the less-evolved, non-white races. Down described (what's now known as) Down's Syndrome patients as Mongoloid. Another aspect of Down person that remind [us of] the Asiatic population, are alimentary characteristics. Down subjects adore having several dishes displayed on the table and have a propensity for food which is rich in monosodium glutamate (a salt of glutamate), such as parmigiano, beef broth, tinned food, etc.. The Chinese food abounds in monosodium glutamate that seems to be responsible for the fifth taste or ‘‘umami taste’’ and of the ‘‘Chinese restaurant syndrome’’. The tendencies of Down subjects to carry out recreative–reabilitative activities, such as embroidery, wicker-working ceramics, book-binding, etc., that is renowned, remind [us of] the Chinese hand-crafts, which need a notable ability, such as Chinese vases or the use of chop-sticks employed for eating by Asiatic populations. Fascinating. I can't wait for their next paper, which will compare black people to chimpanzees. The full text of the paper is available on Dr. Goldacre's website, or here. A woman in Calgary just gave birth to identical quadruplets. This is very rare, about as unlikely as winning the lottery. It poses certain problems for the parents, such as finding four girls names instead of only using one name. Well, these proud new parents did what any sensible person would do: name the kids A, B, C, and D.
I finished reading Hunters of Dune, Brian Herbert and Kevin Anderson's attempt to wrap up Frank Herbert's Dune series. The elder Herbert had the bad manners to die before completing the series, leaving his fans with a cliff-hanger of monstrous proportions. His son and Mr. Anderson have picked up the threads where he left off. The first thing you will note as you read Hunters of Dune is that Brian and Kevin are not the writers Frank was. For one thing, their style is completely different, which is jarring when reading what is, essentially, the last chapter in the Dune saga. However, this is forgivable and is better than the alternative, which would be for them to attempt to imitate Frank's style and fail at it. Overall I found this book rather tedious to read. Where the original Dune books contained many subtleties, leaving the reader to piece together the significance of certain events, Hunters possesses no subtlety and spells out details for you, sometimes more than once. This is a complete pendulum-swing away from the original works and it detracts from the new book. The plot of the new story is not bad, but I feel a little ripped-off that there's still another book to come. Not much seems to happen in this book, and when it does happen there are few surprises. The characters sometimes seem to be playing their parts like train-cars on a rail: ok, this is the part where I subdue the resistance, this is the part where I gather my forces, this is the part where I conquer my last enemy, etc. There don't seem to be any real challenges for the heroes despite the real Enemy's seeming omnipotence. And the identity of the real Enemy is a let-down to me as well. I won't give it away but I feel that this book exists to legitimize the other Dune books written by Brian and Kevin, rather than to wrap up Frank's epic. I'm not convinced that the Enemy was originally conceived to be who B&K have said it is. I have a sneaking suspicion that Frank's original plot has been altered in this regard. As for my recommendation: only read this book if, like me, you are a sucker for finding out what happens. I've dutifully plodded through the last few Terry Goodkind books because I hate leaving the story hanging, and this book is a lot like those: I am reading it because I have to know how it ends. I will buy the next instalment, Sandworms of Dune, but only when it comes out in paperback. 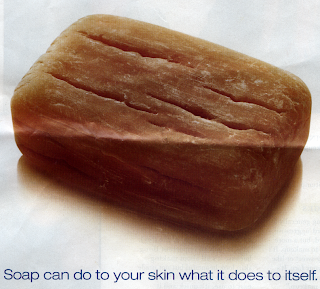 Dove is showing an ad these days that says "Soap can do to your skin what it does to itself." and shows a bar of soap all dried and cracked. What annoys me about this is that soap doesn't do this to itself; it's the water that does this to the soap. A bar of soap will remain pristine for months, but once soaked in water a few times, then left to dry, it will crack. Guess what? Your wooden cutting-board in the kitchen has the same problem. I guess you should use a Dove bar to cut your food too. Or maybe you're not supposed to use water on your skin? This ad is just dumb. I like getting free stuff. Today I went to buy some tea, having used up my stash a few days ago. The tea on the shelf had a promotion: get a free movie pass when you buy this tea. I thought, great! I like free stuff. Then I saw that the promotion had expired (in April! ), but I needed the tea anyway. Luckily for me the tea scanned in at the wrong price, so I got it for free anyway! Take that, expired movie coupon! And as an added bonus, inside the box was a sampler for ice-tea mix. More free stuff! This day can't get any better. The Canadian Government is once again abusing its access to the RCMP to prevent the press from doing their job. The RCMP have been ordered to keep the media away from MPs who are in a hotel for a Conservative Party meeting. It's clearly not a security issue because only the media is excluded; other tourists and guests of the hotel are free to go wherever they want. But the press is forced to wait for officially approved handouts from the government. I can understand the government wanting to present a unified front to the press, but the MPs are highly paid public figures and they should be allowed to talk to the press when they want to, and I'm pretty sure they know how to say "no comment." A free press is critical in keeping the government in check, as was demonstrated by our neighbours to the south in the 70's. Mr. Harper, your iron-fisted, democracy-stifling approach is unacceptable! I can't wait for the next election.